Delegates gather to celebrate the 50th anniversary of Gensler and Turner International. 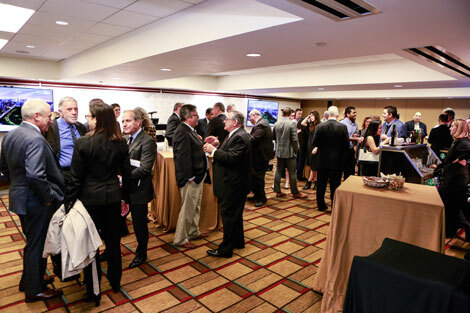 Turner Construction sponsored one of the many host rooms at the CTBUH 2015 International Conference. They conducted several presentations and panel discussions on structural elements of the Wilshire Grand Hotel, the project management of tall buildings, as well as the benefits of lean and BIM on urban mega projects, tall buildings, and local communities. In addition, Turner celebrated its 50th anniversary of working in international markets by holding a reception in conjunction with Gensler Architects, who is also celebrating 50 years as an international design and architecture firm. In the panel discussion titled “Tall Buildings and the Local Community,” Tom Ford, Planning & Urban Design Studio Leader of Gensler, said that a city skyline is as individual as a fingerprint. He also discussed the aspect of human scale at the base of a building, highlighting three in particular to consider: block scale, street scale, and district scale − each is integral and important, as they relate back to the human scale. 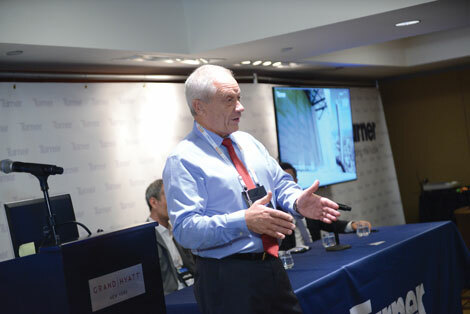 Glen Collins, Project Executive of Turner Construction International, presented on Russia’s evolving skyline, focusing specifically on Moscow City which at one time had 18 separate plots of land all simultaneously under construction. This congestion of buildings, because of their close proximity to one another, made the environment quite impersonal. Collins was not shy in his criticism of these developments. He noted that the retail components of these buildings did not have any major or anchor tenants. Many of the stores were high-end retailers, pricing out local residents. He argued that it gave the impression of an elitist society: one that prefers to be separated from the rest of society. This, in addition to poor transportation and a lack of open space, created an environment where there were very few shoppers within Moscow City. Turner’s IC2 project was specifically designed to encourage people to walk instead of using automobiles, an idea that fostered connectivity between the different developments. Everyone agreed that it would be a major (yet positive) change for developers to shift towards a shared goal of producing projects that promote more walking and less driving − a transition that is healthy for both people and the environment. Nicholas Billotti, Chairman, Turner International. Towards the end of day one, a reception celebrating both Turner International and Genslers’ 50th anniversary was hosted by Dian Hoskins, Co-CEO of Gensler, and Nicholas Billotti, Chairman of Turner International. Some in attendance expressed concern that contractors may be reluctant to get involved early in the process and provide valued input without some assurance of a fair tendering and award process. the panel stated that, to eliminate any sense of mistrust, there must be complete openness and transparency during tendering and award. This begins with a comprehensive prequalification process, so that contractors know they are competing on a level playing field with other companies that are legitimately qualified to tender. A successful prequalification process will require two to six months to complete, and this must be planned for well in advance so it fits properly into the master schedule of any development. A closing comment to this session was that, to be innovative, one must step forward early in the process.